Time domain items are in the oscilloscope display are listed with explanations. Hi once more and welcome to our 90th Test and Measurement Video. 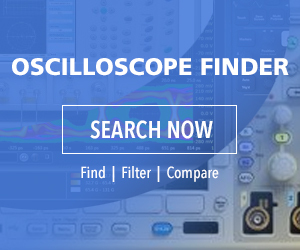 Today’s topic is the Tektronix MDO3000 Series Oscilloscope, and items that appear in its time domain display. To illustrate, we accessed a ramp waveform from the arbitrary function generator and fed it into the Channel One analog input via a BNC cable and displayed it in the time domain. Then, to make it more interesting, we pressed Cursors. There are approximately 20 items that then appear in the time domain display. However, they do not all appear at the same time. Starting at the upper left corner, just after the Tek logo, is the Run/Stop indicator. At a glance, you can tell whether the acquisition is running or stopped. This condition is determined by pressing the Run/Stop and Single Acquisition buttons. The trigger position, an orange T icon, at the top center, shows the trigger position along the horizontal time base. The expansion point, a small orange triangle, shows the point that the horizontal scale expands and compresses around. By pressing Acquire and turning Delay off, we can shift the trigger point and expansion point back along the time base. The waveform record view shows the trigger location relative to the Waveform Record. The brackets show the part of the record currently displayed. To the right at the top, we see the trigger status. Alternatives are Pretrig: Acquiring pretrigger data, Trig? with a question mark: Waiting for trigger, Triggered as we see here, and Auto, which means acquiring untriggered data. The security icon, not shown here, indicates that input/output ports are disabled. The cursor readout, the box at the upper right, displays values delineated by the cursors when doing manual measurements. Time, amplitude and delta values are shown for each cursor. For FFT measurements, it displays frequency and magnitude. For serial and parallel buses, the readout shows the decoded value. The trigger level icon shows the trigger level on the waveform. Notice that when we set it above or below the waveform peaks, triggering is lost and the waveform becomes unstable. The trigger readout shows the source, slope and level. The number changes as we adjust the trigger level. The top line of the record length/sampling rate shows the sampling rate. Turn the horizontal scale knob to adjust it. The record length is displayed in the bottom line. The horizontal position/scale readout displays the horizontal scale on the top line. It can be adjusted by means of the horizontal scale knob. The channel readout shows the channel scale factor per division, coupling, invert and bandwidth status. For digital channels, the baseline indicators point to the high and low levels. The indicator colors follow the color code used for resistors. D0 is black, D1 is brown, D2 is red, etc. The group icon indicates when the digital channels are grouped. The bus display shows decoded packet level information for serial buses or parallel buses. The bus indicator shows the bus number and bus type. For analog channels, the waveform baseline indicator shows the zero-volt level of a waveform, if you have not introduced an offset. The icon colors correspond to the waveform colors. Thanks for watching. New videos are added periodically, so check back frequently.